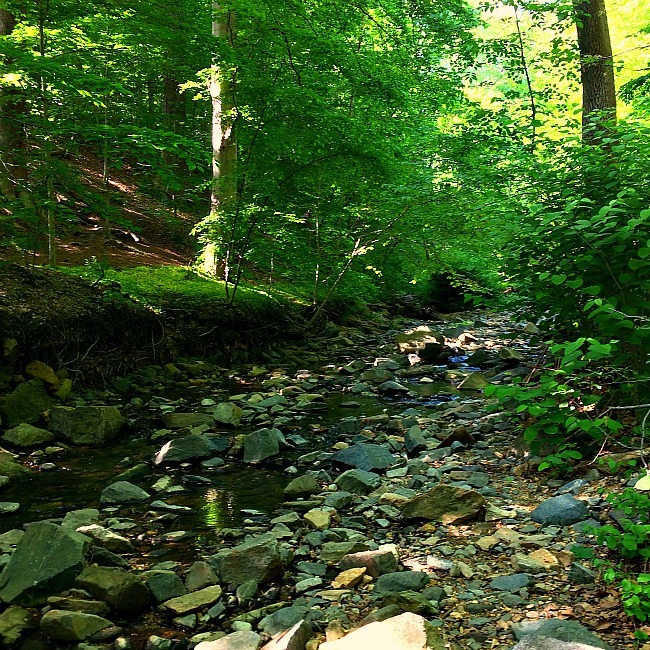 Did you know there is a fantastic State Park literally in the backyard of Baltimore? 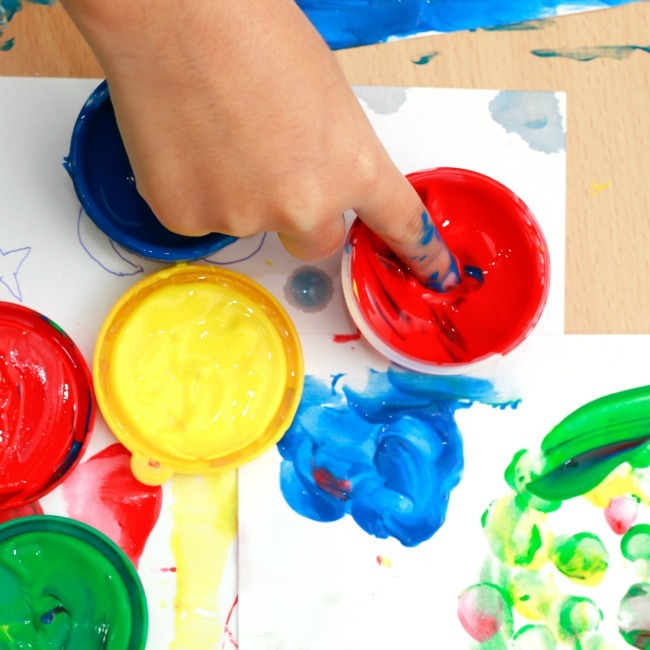 Did you know that there are numerous fun activities that are well suited for families with young children? 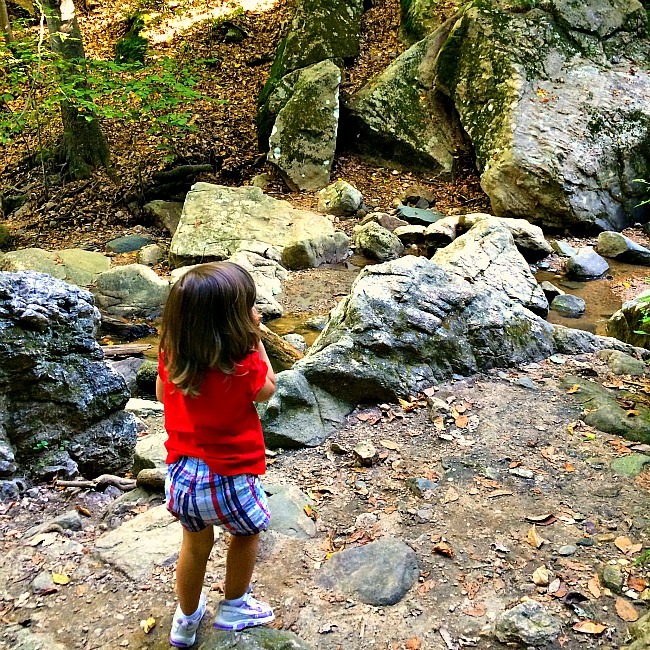 Well, Patapsco State Park is an incredible jewel and any parent who wants to get outside with their kids should have this State Park at the top of their Fun Things to Do With Kids in Maryland list! 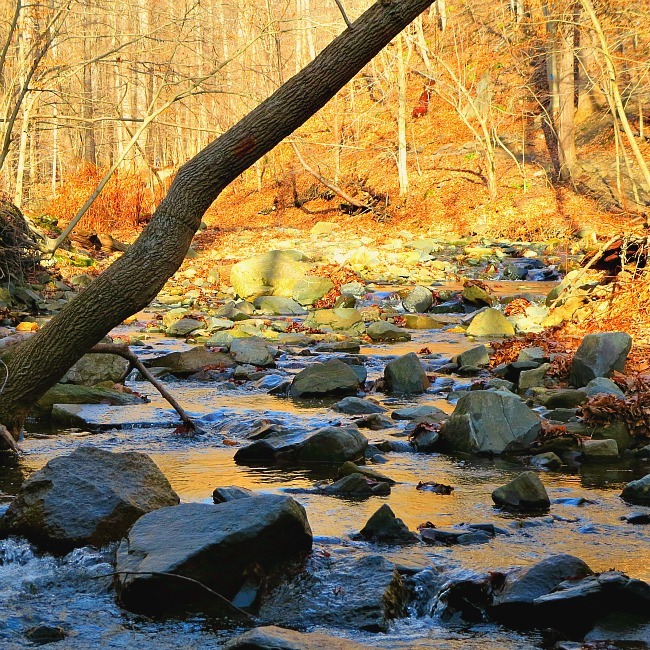 Patapsco Valley State Park is huge and spans multiple counties in Maryland. 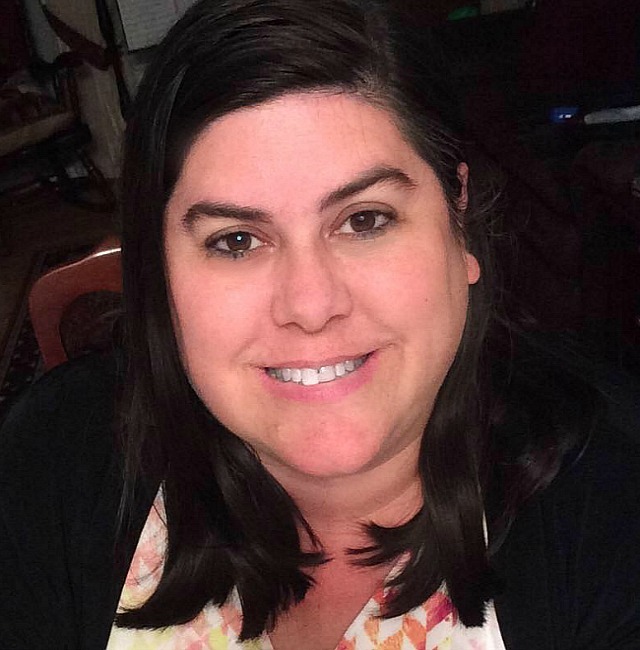 Today I will focus on the Orange Grove/Glen Artney/Avalon area since there are quite a few family friendly options in this part of the park that are sure to tickle your kids’ happy spots! 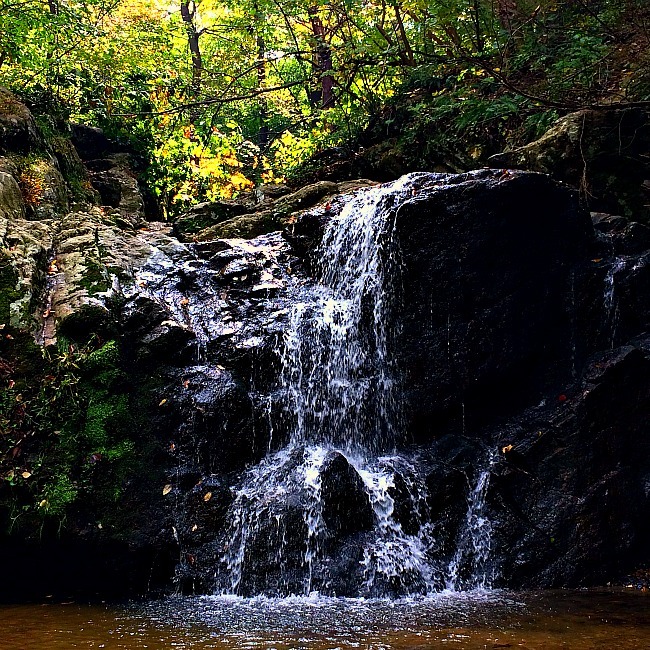 One of the best things about the Patapsco Valley State Park is that it is incredibly accessible, especially for anyone living in Howard County, Baltimore County, or the City of Baltimore. To get here, take I-95 or I-295 to I-195 (the highway that takes you to the BWI airport). Get off at Exit 3 for Rt. 1 and follow signs for Route 1 South towards Elkridge. Follow the signs for the park and turn right onto South Street (not very far, about 1/2 mile). Almost immediately you will turn left into the park. As you drive along the entrance road and your blood pressure starts to drop (yes, it is a really pretty drive), don’t forget to look out for the Thomas Viaduct. Ok, you can’t miss it actually… but point it out to your kids as you drive under it. This viaduct is actually the world’s largest multiple arched stone railroad bridge that has an arc. Too technical? Well, it looks really cool too. After you go through the guard shack, there are three distinct areas you can visit. 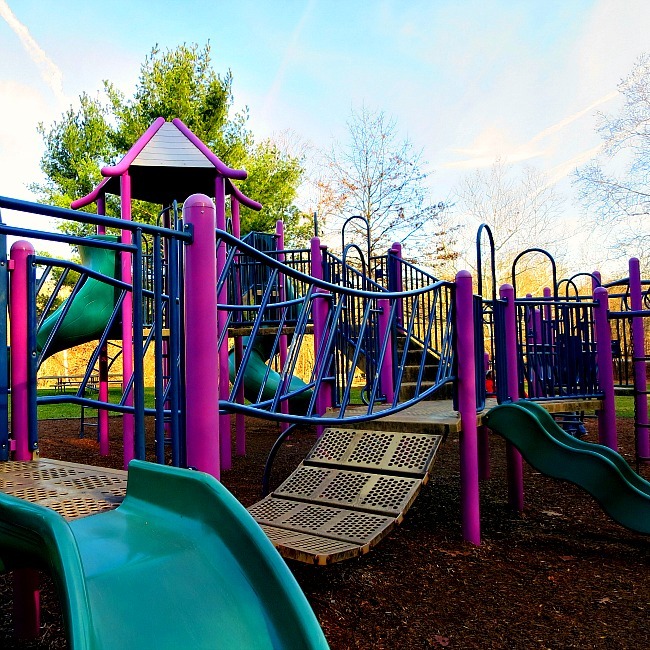 All three areas have fun activities for your kids and the three areas are connected. 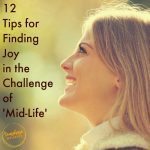 Depending on how long you have, you could do it all or pick and choose. 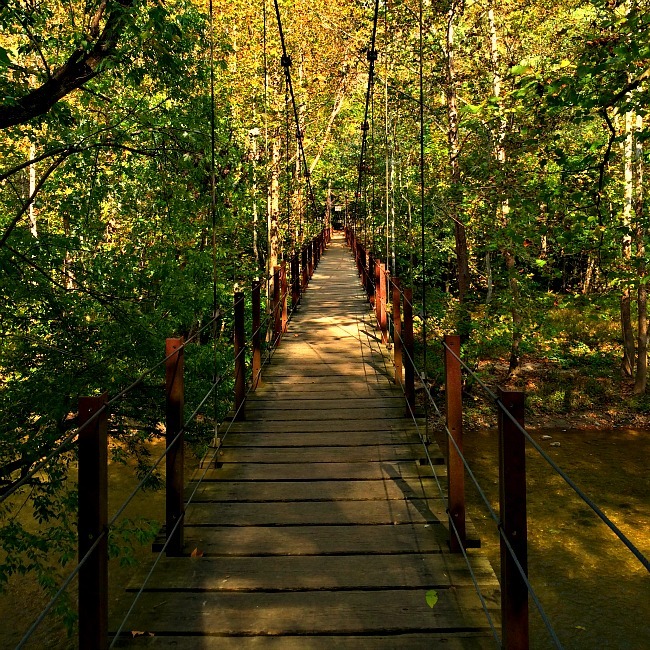 The Swinging Bridge– This bridge is positively iconic. Depending on the age and temperament of your wee one, you may want to be extra vigilant when crossing the bridge. However, it is sure to delight everyone because yes, it does swing. 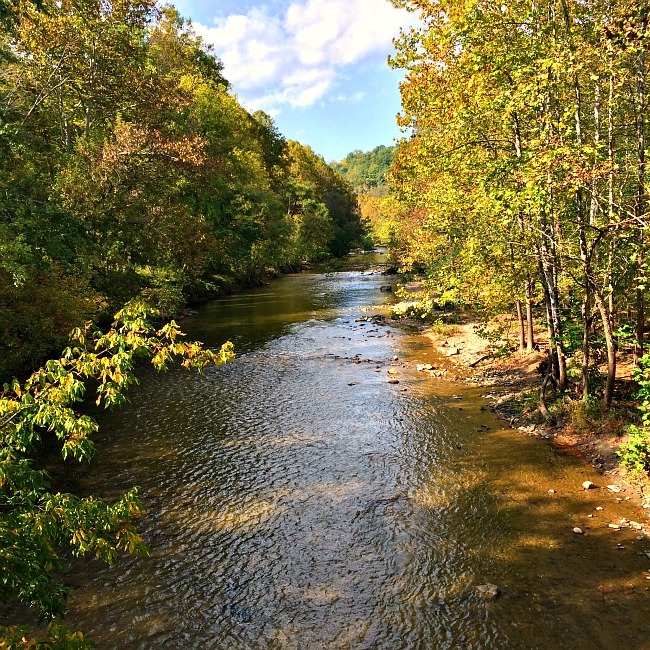 More importantly though, the views of Patapsco River are spectacular from this bridge. 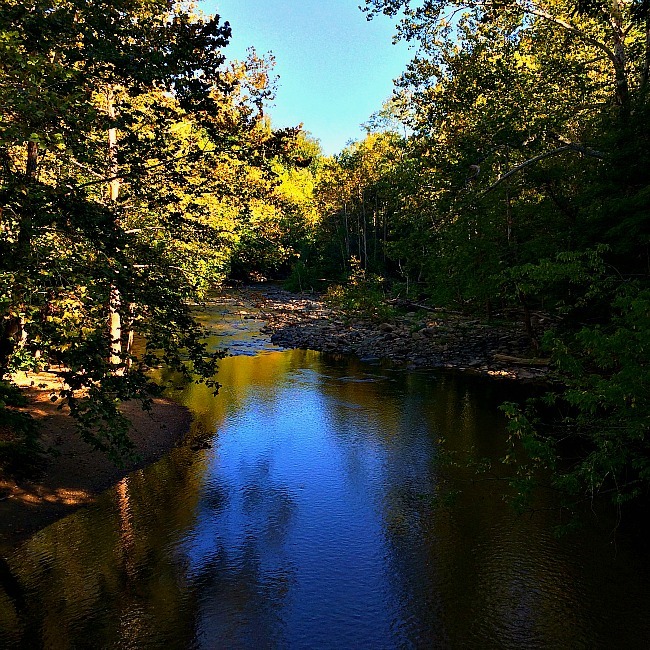 Grist Mill Trail– After you cross the swinging bridge, you will be on Grist Mill Trail. I cannot stress enough how amazing this trail is. It is wheelchair accessible. It is paved, wide, and relatively level (no hills to speak of). 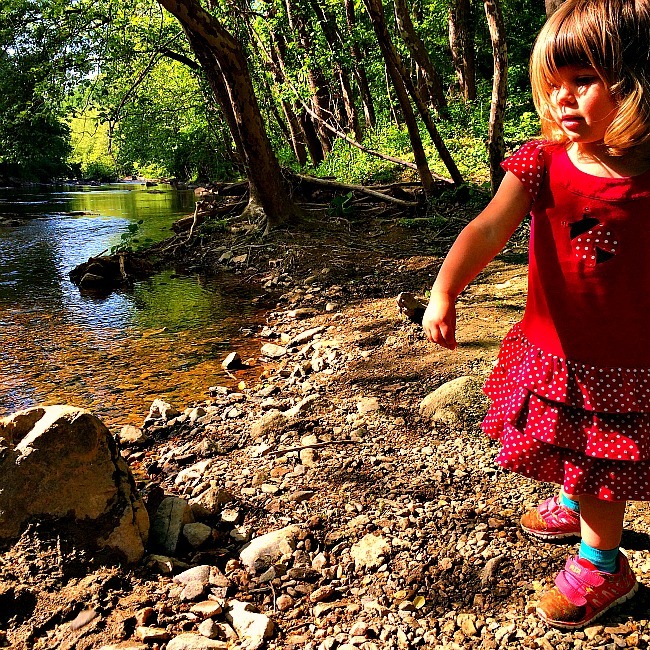 Along the way, there are cut outs to the river that are great for exploring with even the smallest of children. If you turn left after the bridge, you can walk all the way to Bloede Dam, but we always stop about 3/4 mile down the trail and walk under the railroad track tunnel to the other side. There are connecting trails here that I know we will explore as Sweet Pea gets older. However, the view is pretty fantastic at this point as well. 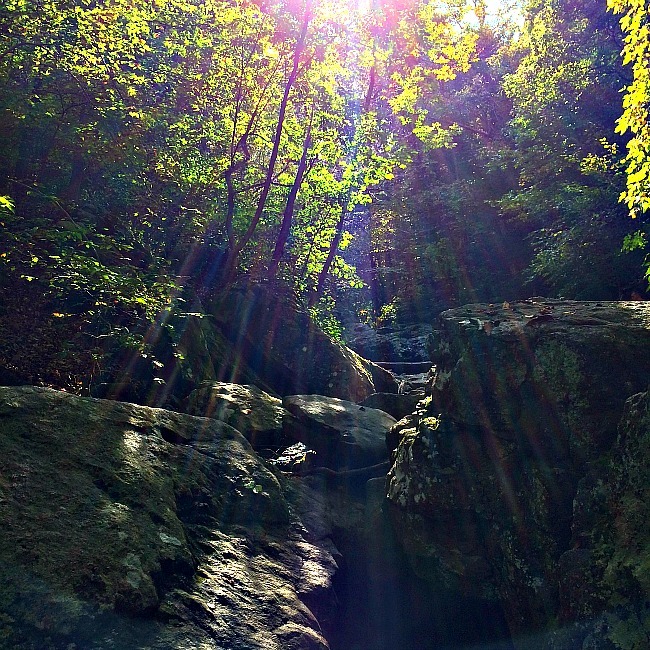 Cascade Falls– I have a confession to make. 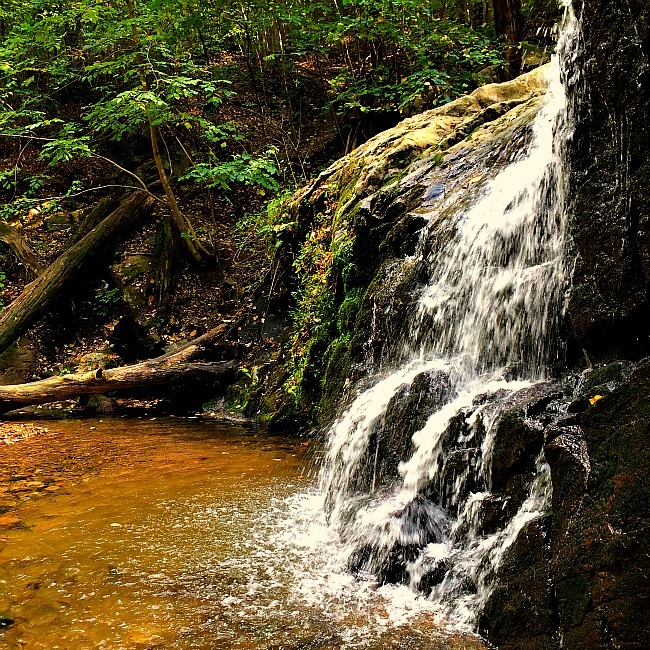 We had been visiting Patapsco Valley State Park for many, many years before we ever made the mini-trek to Cascade Falls. The start of the Cascade Falls Trail makes it look like a doozy of a hike. However, that could not be further from the truth! This hike is amazing! There is a small climb at first, but the reason why this hike is so awesome, is that within 10 minutes (yes, you read that right.. 10 minutes), you will be standing at the foot of Cascade Falls. Wow, this waterfall hike is all bang, hardly any buck. Seriously, we took Sweet Pea when she was still 2 years old and she had no problem hiking to this waterfall at all. 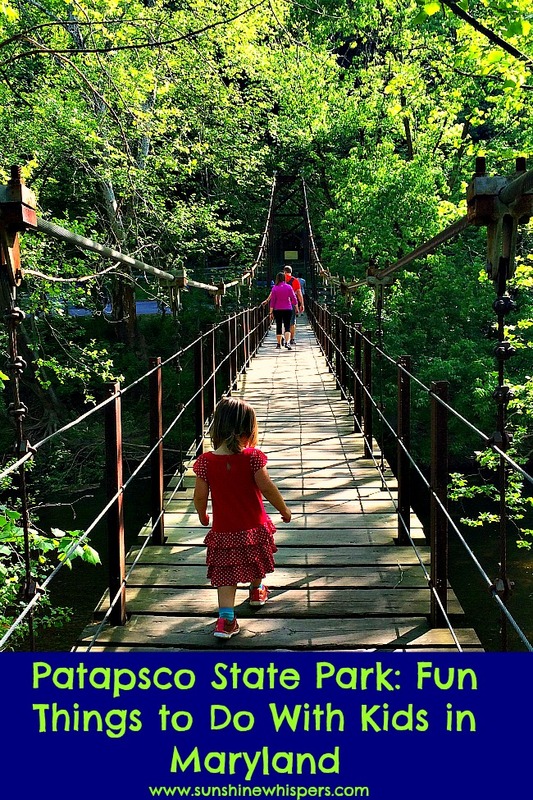 If you want to take your little-legged family members on a hike that they will love without begging for you to carry them… this is the hike you want to go on. Just do it.. and do it now! Logistics— This area is actually quite easy to get to. After going through the park guard shack, you will be in the Avalon Area. Turn left and follow the road past the big picnic area and playground (see below) and drive about 2 miles until you reach the parking area and swinging bridge (it will be very obvious). Most of the time there is ample parking here. 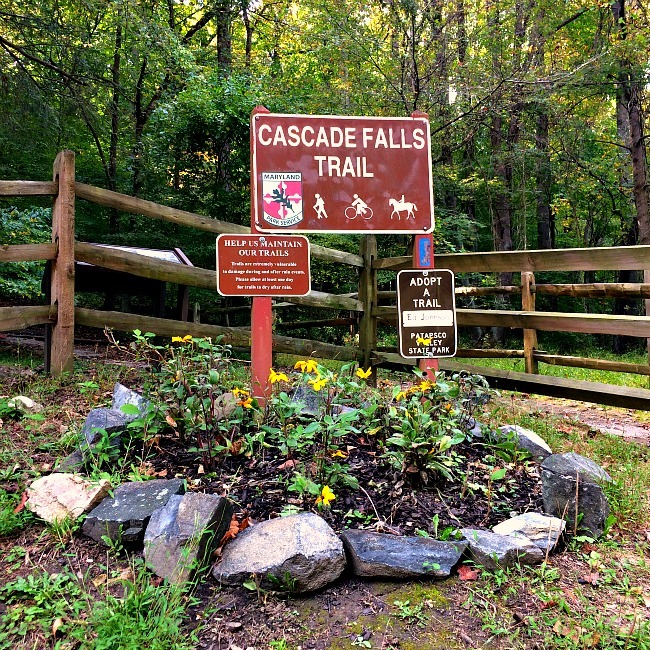 Additionally, there are restroom facilities located across the street from the swinging bridge, at the trailhead for the Cascade Falls Trail. 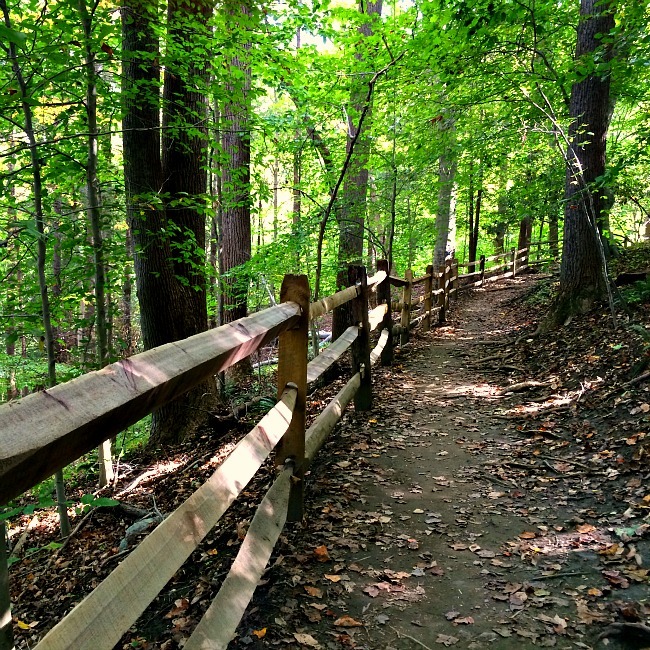 It should be obvious, but for the Cascade Falls Trail, walk up the first incline, then turn left to follow the split rail fence. Once the fence ends, veer right and the falls will literally be in front of you (well, 5 more minutes.. but you are following the river to the falls). The Avalon Area is the perfect place to visit at the end of your park trip. Why? 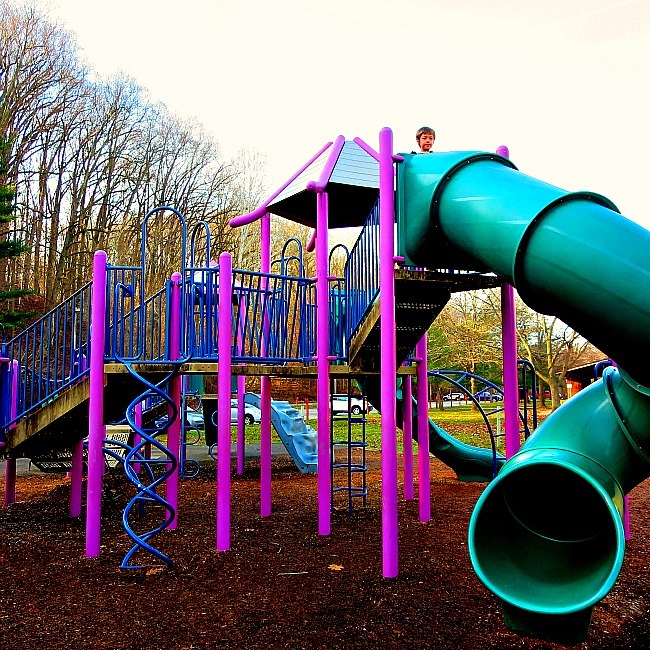 Because it has a fantastic playground. 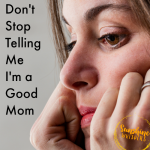 So, if your young kid starts to get long in the tooth because they don’t want to walk anymore… or something like that, you can entice them to walk further by promising a stop at the playground on the way out of the park. This works EVERY TIME. See, the kids will see the awesome playground as you drive by on your way to Orange Grove. It is really a great playground too. In addition to the play structure there are tons of swings for older kids, toddlers, and even kids with special needs. The other great aspect of the Avalon Area is that it boasts picnic facilities that can accommodate up to 100 people. You have to reserve in advance but we often see family reunions, birthday parties, etc… being held as we drive by. It is not nearly as crowded as the Orange Grove Area. True, there is not a swinging bridge or a waterfall. However, when the Orange Grove Area is overrun with people but you still want to spend some time in nature with your kids, turn right at the Avalon Area fork in the road and follow the road (taking another left) to this area of the park. Drive slowly… there will be lots of runners, walkers, and bicyclists. Turn right to drive under the railroad track tunnel and then you can start meandering. At this point, the Glen Artney Area is essentially a loop (so, you can pick left or right). The loop is dotted with many smaller picnic areas and at least 1 or 2 larger areas that also have playgrounds (smaller than the Avalon Area playground though). 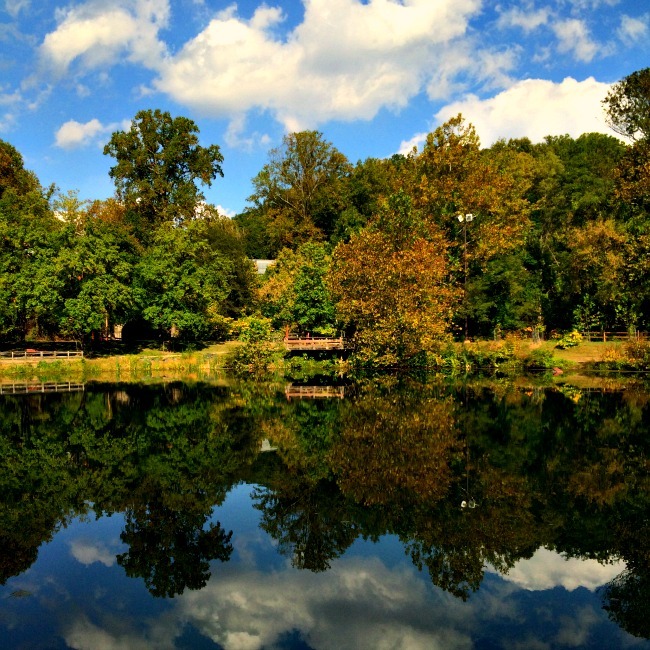 Even if you are not in the mood to picnic or grill out, you can pull into any of these picnic areas and have a relatively secluded ‘explore nature’ experience with your kids. Additionally, there are a few trailheads in this area that will connect with other parts of the park, as well as the river itself. Lost Lake– As you enter the Glen Artney Area, there will be a small parking area on your left, and extending past the railroad track tunnel. If you can get a parking spot, you should definitely check out Lost Lake. The lake is beautiful to walk around, and there are picnic tables set up at numerous locations. 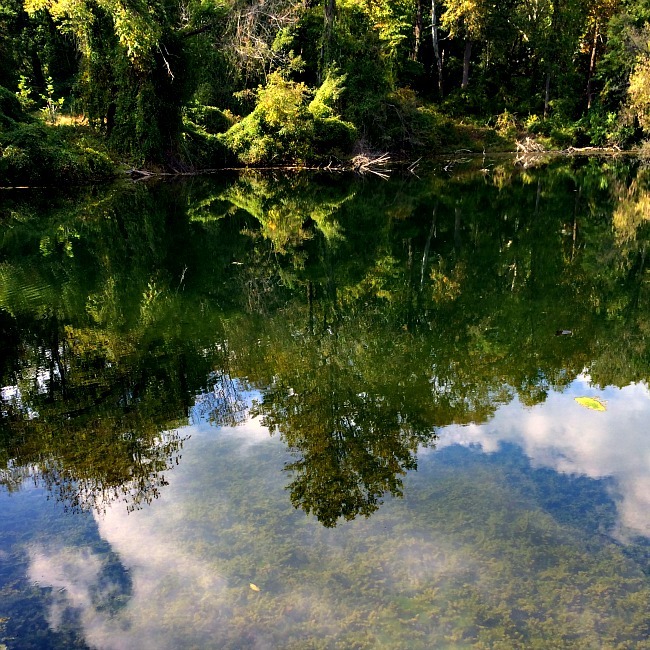 Also, the lake is stocked with fish and is a perfect place to introduce kids to fishing. 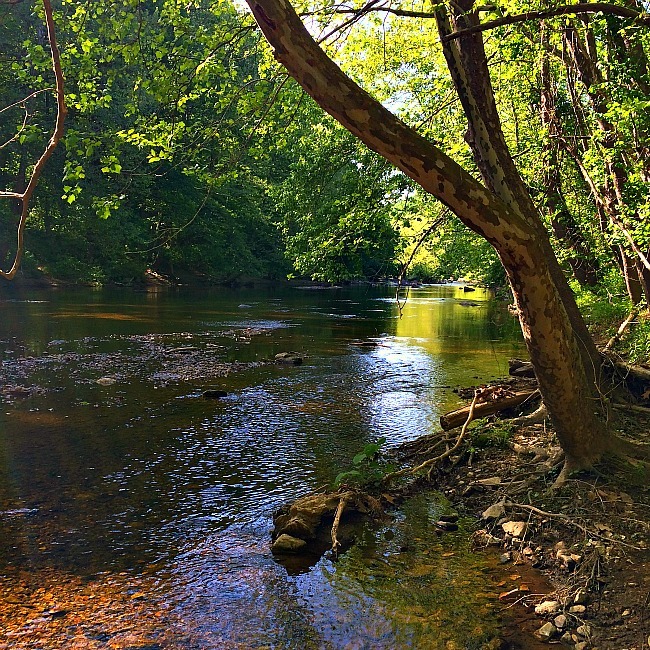 Patapsco Valley State Park can get really crowded. On weekends and holiday during the late Spring through mid Fall, the park will fill up and park rangers will turn you away. If this is the only time you can visit the park, come early. Otherwise, I would highly recommend trying to visit on a weekday, even after work. The park is beautiful, but it is even more beautiful when you don’t have to share it with the hordes of humanity. Visit the park every season. Seriously. There may not be leaves on the trees, but this park is still totally beautiful in late Fall and Winter. I haven’t been after a good snow yet, but I imagine the Grist Mill Trail in particular is magical after a snowfall. Bring food and water.. and a trash bag. There are no concession facilities here so bring a snack and some water. However, this is a zero trash park, so be prepared to leave with your trash as well. 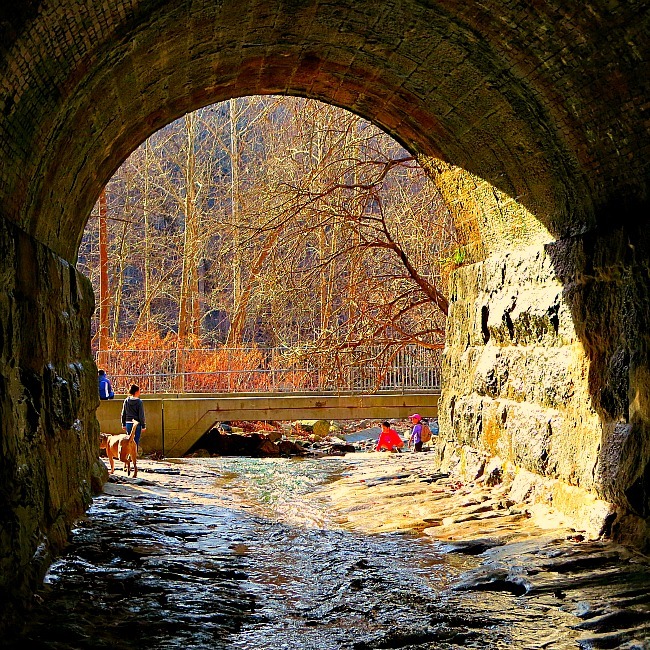 I hope you can make the time to visit Patapsco Valley State Park very soon. The park seem very peaceful and far from the traffic. I think it wouldn’t be bad if my sister take her son there, as she seeking a place like this where they don’t have to be worried about traffic and crowd.